Wormwood: Revelation launches on August 11th, 2010. Feel free to distribute this audio promo in its entirety in whatever venue you choose. Link to www.wormwoodshow.com. Copyright 2010 Habit Forming Films, LLC. This entry was posted by Wormwood on Friday, July 30th, 2010 at 11:05 am	and is filed under news & updates, podcast, promotional, Publicity. You can follow any responses to this entry through the RSS 2.0 feed. You can leave a response, or trackback from your own site. 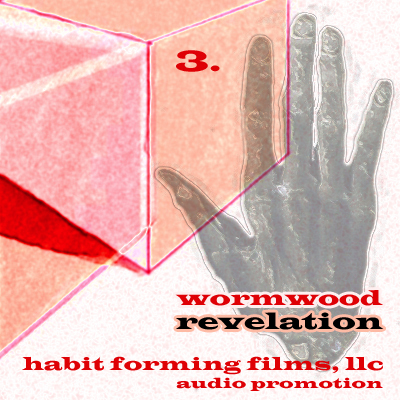 Wormwood: A Serialized Mystery is a full-cast audio mystery that brings the spirit of the radio drama into the 21st century world of podcasting, mp3 technology and RSS feeds. We tell stories to rival the best of television -- using only the theater of the mind. Nice!!! Now that the recording is done, can’t wait to get the finished product cut together and out to the drooling, shambling masses! !